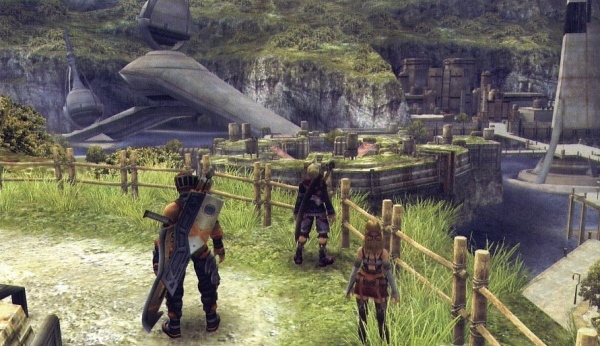 I have finally started playing Xenoblade Chronicles, I wonder how long I have waited to do that? And it feels great to have started, I love most Monolith Softwares games well at least the ones with Xeno in the title and I really had to play this one too. Since I’ve heard so many good things about it, even from people who normally don’t play JRPG’s. I’m not very far into the game, since I’ve lost myself in doing errands and checking out the huge world and I’m betting I’ve seen nothing yet. There are huge plains and fields in this game and the game really gives you a great feeling of traveling long was. This is both good and bad, since it takes a while to get too places. But once you’ve unlocked a place you can fast travel there. The music so far is awesome! I especially like the track “You Will Know Our Names” it’s so good! Especially around the the 1minute mark, good god! My ears are in heaven! I love music like this! Ahh!! Going to play a bit more in just a bit, need to play what I can since I start working again this Thursday. Today there was also an announcement about some new characters joining the new Super Smash Bros game. Which got me really excited since there was a rumor and a “leak” that Shulk from Xenoblade Chronicles would join the cast. We still don’t know if this is true or not, but we got two new Fire Emblem characters and a reveal that Captain Falcon is returning. We got Luciana and Robin (both male and female) as new players and Chrom seems to be Robin’s final smash. Den är också helt underbar! som du säger finns det många bra låtar ifrån spelet. Bara sitter och myser åt allt musik, känns som det var längesedan jag gjorde det i något spel. Lania recently posted…Spelsommaren som kom av sig?